Pink, pink and some more pink! I did manage, with The Kid’s help, to get two more projects completed. And of course, as the title hints exclaims, both are finished in my favorite shades of pink. First came the trunk which I imagine being used as either a toy box or perhaps a keepsake trunk. I found this on the curb about three houses down from where I was picking up some piece of furniture, just sitting there forlorn. To be fair, it had seen better days and it needed new hardware, as the lid was sitting next to it. But I could see the potential. It got a light sanding and a base primer. 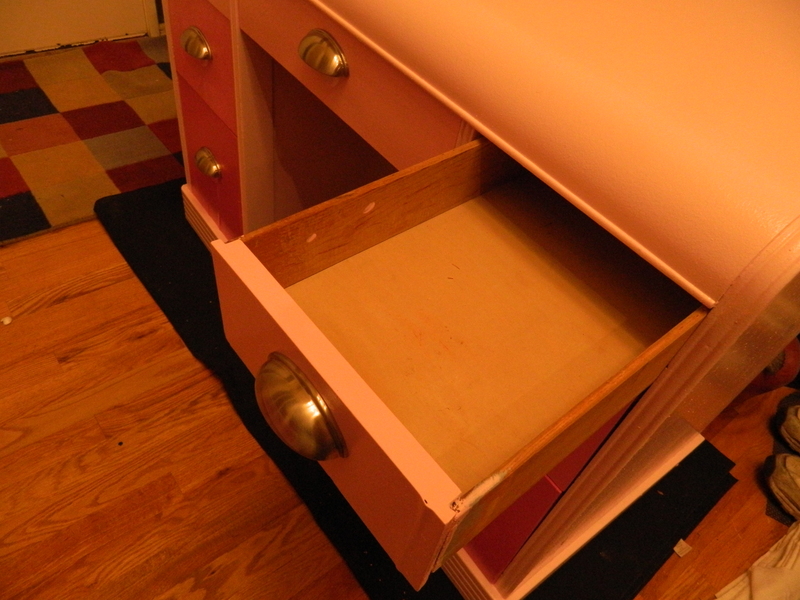 Then I replaced the hinge and added a ‘soft down lid’ hinge, keeps the lid from slamming on little fingers. I also added felt around the top of the box to prevent it from banging when closed. 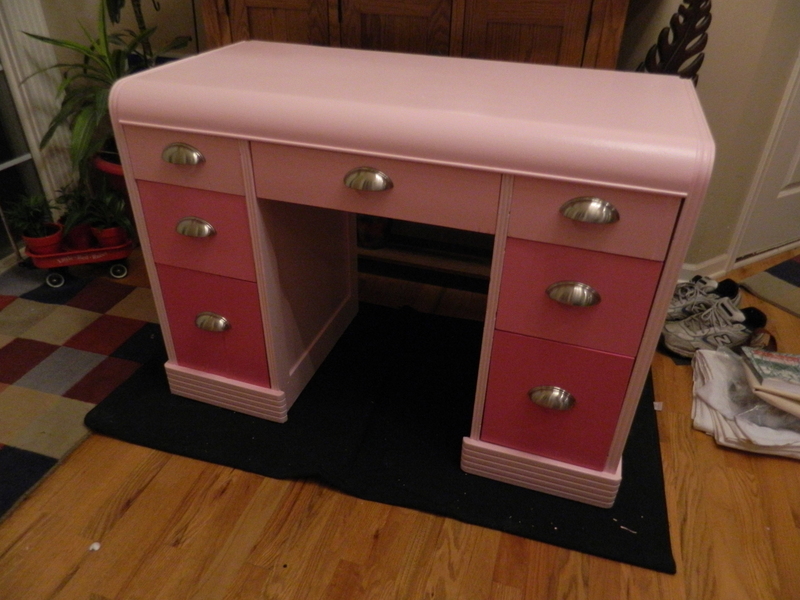 Once the hardware was done, I applied two coats of pale pink in a high gloss finish. At that time, it was transferred to the ottoman in front of the couch (halfway between the couch and television), so that I could hand paint the “dots” and still watch my recent binge… “Nurse Jackie”. But that is a whole ‘nuther discussion! Using four simple round objects – a plate, a bowl, a large glass and a small glass – I randomly marked circles over the entirety of the box. Then it was time to sit back and paint them all in. One thing I did learn was to not paint the very lightest color when the room was dim… found the following morning that I hadn’t done such a great job after all. 🙂 Just took a little clean up and second coats on most of the colors. But in the end, it turned out fabulous. 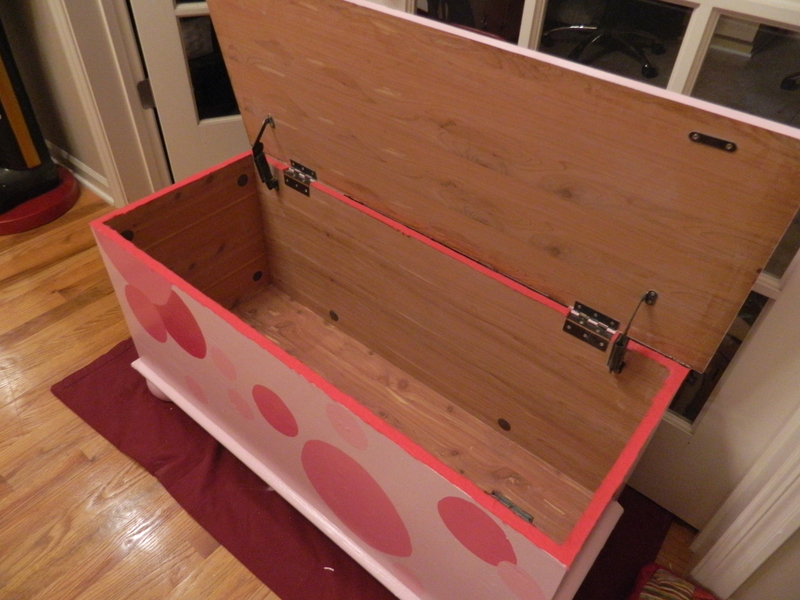 The trunk is lined with cedar, but I am sure that it is only a veneer. Still, smells nice and I am pretty sure would repel moths. Next up is the little desk that I picked up from a thrift store for $8. My original intention was to take it apart and stack the drawer units to create a tall vanity, but The Kid pointed out that it had a waterfall front and was in more than awesome shape, so he talked me into painting it too. 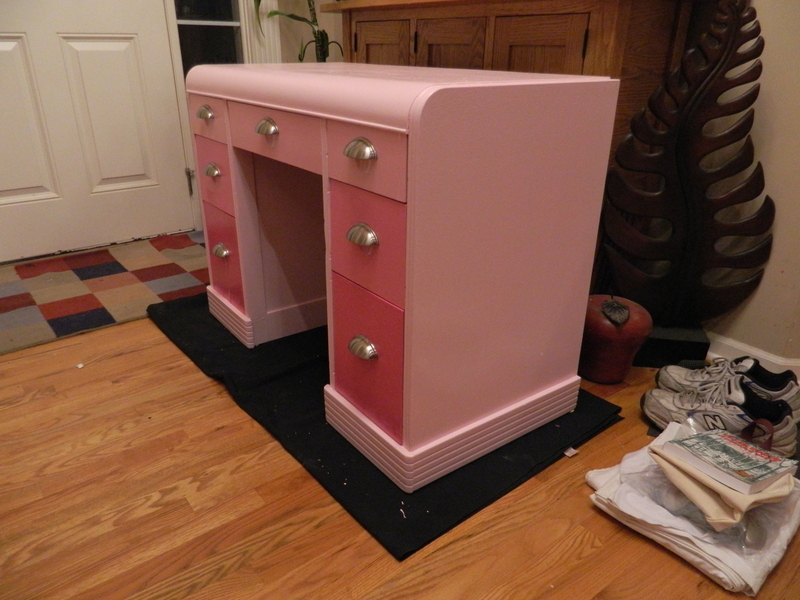 Once again, it was primed and painted the base coat of pink. I love the way the high gloss looks, making everything look very shiny. 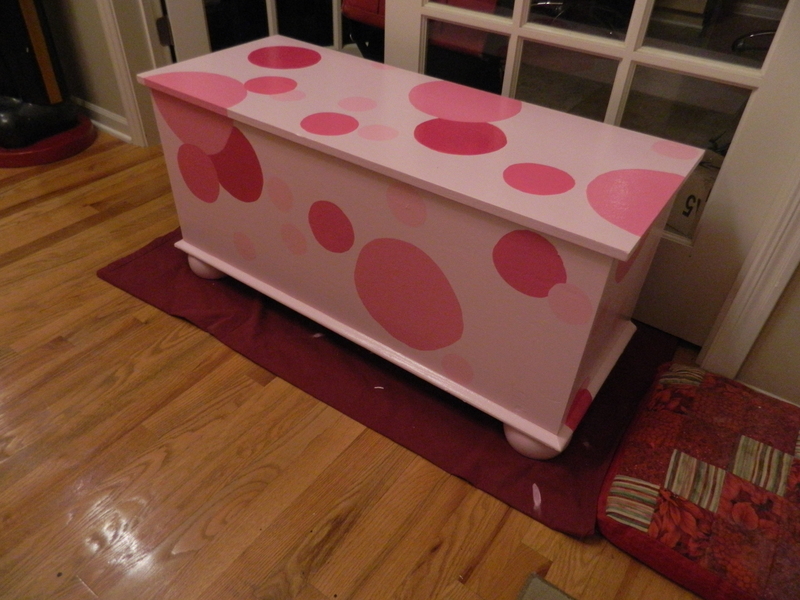 Then the drawers (also primed) received one of four colors of paint, the ombré style of painting. I can’t get enough of this, it makes me think of little princesses. It previously had these weird wood handles over indentions and I didn’t want to put them back on. A while back, I had purchased handles for another project that didn’t turn out, so I opted to use them on the desk. Again, loved the way this turned out. The photo makes it look a little darker than it really is, I waited until evening to take the picture, so there isn’t a whole lot of natural light. And speaking of pictures, I have reverted to my old (bad) habit of not taking a ‘before’ photo. Sigh. I didn’t have pictures of either of these projects, but live and let live. I like the ‘after’ photos better anyway. Another angle. This piece could easily be used as a vanity as well. A cute little dresser mirror on top and viola!, vanity! All wood construction, always start with good bones. This was just too good of a deal to pass up. Well into the next couple of projects, trying to get things cleared up in the garage, so that I can do my remodel out there. My plan is the effectively build a wall between the larger and smaller garage bays and get some vertical height in which to store things. Right now its all on the floor, which takes up more room than I want. I really want to be able to all the cars in the garage when necessary (I live in tornado alley after all) by just moving a few things out of the way. Right now, I feel lucky when I can get one of my three cars into the garage. Need organization!